Our company is also engaged in manufacturing, trading and supplying of Bungalow Lifts. We are involved in manufacturing and supplying an extensive range of StarOut Bungalow Lift that are designed to meet the needs of vertical mobility. These products find applications in duplex villas, bungalows, pent houses, terrace flats, and showrooms. 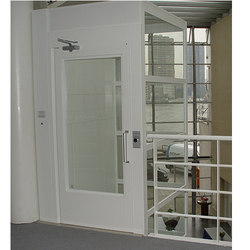 Our clients can avail these lifts with various safety features as well as automatic controls and we offer them at most competitive prices to our valuable clients. Star Elevators Internal Bungalow Lifts are elevators designed to meet vertical mobility needs in public and private buildings. It is the ideal solution for elderly and impaired mobility persons which can finally move autonomously and free from stairs. They are modern products, designed and manufactured to meet a wide range of needs, from the garage to the roof, you can move effortless up to 4 floors. Our clients can avail from us a premium quality range of Residential Elevator Lifts, which are available at industry leading prices to the clients. These products are widely appreciated for their long lasting nature and available for villas, bungalows and residential complexes. Our lifts are designed beautifully and are available with safety gates in the national as well as international market. Elevator lifts are used in Internal/Outhouse/Bungalow/Home.